The Essential Take That are without doubt one of the very best vocal tribute acts anywhere in the UK. If you want to hear uncannily accurate recreations of the boy's big hits, look no further than this top quality act. Featuring four young professional vocalists with impressive West End pedigrees, this is an act that's a cut above the competition. With superb live vocals and harmonies, the four combine effortlessly to make this an experience for the true Take That connoisseur. With style, energy and professionalism to match, The Essential Take that will keep any crowd singing and dancing along, to their favourite Take That hits. Recreating the sound and the feel of the UK's favourite boy band. The Essential Take That rise to the occassion every time. The band is based in the midlands, but perform all over the UK and overseas. A professional high end show that delivers not just great music, but also a flexible and approachable group of vocalists, who are totally committed to ensuring that everybody has a great time at your event. Sorry, The Essential Take That doesn't have any photos right now Send us an enquiry and we'll get back to you, or check out the rest of the act profile. 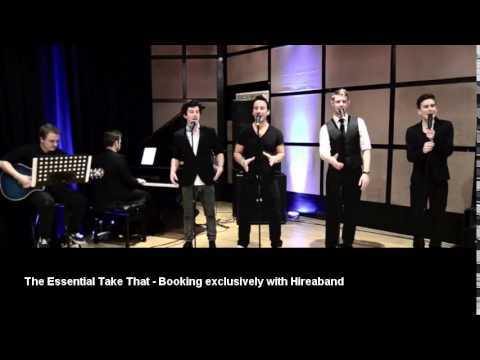 Our first time of contact with The Essential Take That was over the phone and we found them to be very friendly and extremely professional.